Moujean Tea (Nashia Inaguensis) other names : Bahama Berry , Moujean Tea , Pineapple Verbena. 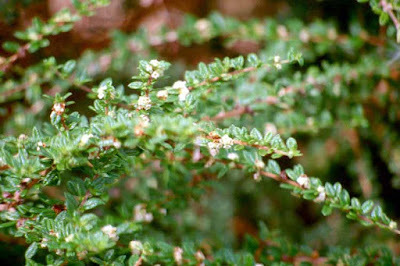 An evergreen shrub, moujean tea is indigenous to the Inagua Island in the Bahamas. Often, this shrub is grown in the form of a bonsai plant, as its features are miniaturized. Moujean tea bears minute white flowers that appear in clusters during the summer and this is followed by small reddish-orange hued berries. Moujean tea has a preference for complete sunlight, warmth and elevated levels of humidity. Moujean tea should always be kept damp to wet and never allowed to become dry. If you are growing moujean tea indoors, moujean tea will like to have warm feet during the winter months - you may try using a heat mat. As discussed earlier, moujean tea or Nashia inaguensis is a small, perennially growing, evergreen shrub having elongated curved stems. The leaves of this species are miniaturized growing up to anything between one-fourth inch and half-an-inch in length. The leaves are shiny and their surface texture is wrinkled and coated with minute hairs. When crushed or bruised, the leaves emit an aroma that has been compared to vanilla, honey or citrus. The tiny white flowers of moujean tea are extremely aromatic, but inconspicuous. The flowers appear in clusters at the nodes of the leaves. 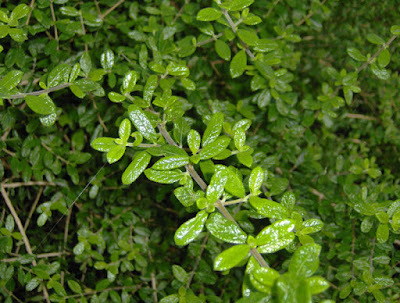 Moujean tea is a loosely growing and spreading shrub having several branches. Moujean tea may grow up to a height of 2 meters and its mature trunk may measure 5 cm to 10 cm across. Moujean tea bears fragrant leaves that are simple and appear opposite to each other on the stem. The shape of the leaves varies from ovate to elliptic to spatulate, and they are rolled back at the margins (revolute). The flower heads are sessile, axillary and few flowered, having a strigose (having stiff bristles) calyx. The corolla is white-hued, four lobed and measures roughly 2 mm in length. The corolla contains four stamens. While the shrub’s foliage is extremely fragrant, the pollinators, especially the Atlas butterfly, find the tiny white flowers of moujean tea very attractive. Often this shrub is also referred to as pineapple verbena - an incredibly aromatic plant. Apart from the flowers having a strong jasmine fragrance, when crushed or bruised, the leaves too emit a spicy fragrance similar to that of vanilla, honey or citrus. Moujean tea is seldom found growing in wild, even in its native places. Moujean tea is mainly a cultivated species. This shrub can thrive well in several different types of soil, but moujean tea necessarily requires a soil that is rich in organic substances and is also well drained. However, moujean tea is very sensitive and cannot tolerate drying out. While many species generally return from the edge of withering when they are watered properly, moujean tea does not. When moujean tea started wilting, moujean tea does not bounce back to life even after watering following a dry spell. Hence, you need to ensure that you should not allow the moujean tea to dry out. At the same time, moujean tea also does not like soggy roots. It is, therefore, advisable that you plant them in such a place in your garden or yard where you will usually not forget to water moujean tea regularly. Moujean tea is also somewhat susceptible to cold; however, moujean tea grows extremely well in containers, provided they are positioned close to a south facing window receiving enough sunlight. Moreover, moujean tea also possesses the aptitude to survive well indoors during the winter months. Moujean tea plants may become somewhat leggy as well as spindly in case you allow them to grow freely. However, they will just be right and fit the pots excellently when you prune them with caution. Moujean tea is also known as "I Dry - I Die". Dissimilar to several tropical plants that can be restored to life even from the verge of death and wilting, moujean tea plant is very sensitive and dies when the soil becomes dry. In fact, moujean tea, also known as Bahama berry prefers a warm or hot climatic condition. When grown indoors, moujean tea will like to have warm feet, especially during the winter months. When growing in its place of origin, moujean tea is often a creeper, crawling along sunny, rocky outcroppings, which are partially sheltered from continuous high gusts. Propagating moujean tea is quite easy. Moujean tea has a preference for a fertile, properly drained soil. However, moujean tea plants possess the aptitude to endure various different types of soils. 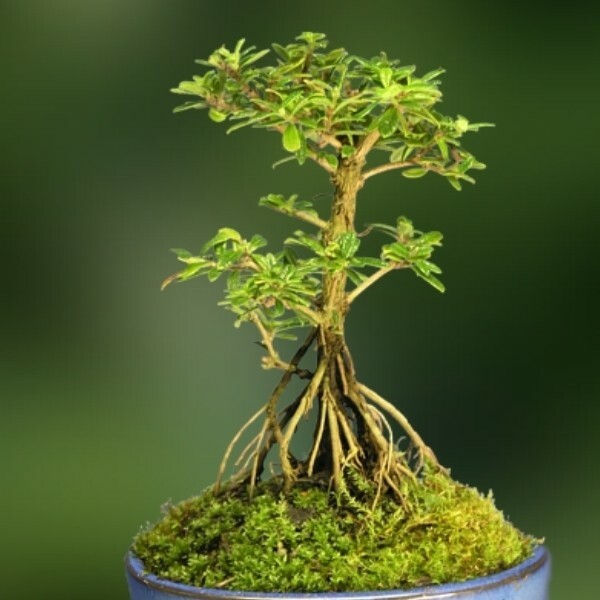 Nashia inaguensis or moujean tea is a wonderful plant for growing in the form of a house plant or bonsai shrub. Moujean tea draws plenty of butterflies, bees and birds. Various people have described the decoction prepared with the aromatic leaves of moujean tea differently. Some have likened it to the aroma and flavour of vanilla or citrus, while there are others who say that moujean tea is akin to pineapple. This decoction is used in the form of an herbal tea. It is said that this herbal tea has calming as well as relaxing attributes. Moujean tea may be given to people enduring nervous anxiety or those who have a nervous breakdown. As far as its aroma and flavour is concerned, the potential of moujean tea is vast; however, it is really unfortunate that they have not been realized fully so far. The aroma of this shrub is perfect for use in manufacture of soaps, candles, potpourri and scented oils. Moujean tea produces minute leaves as well as fruits, which may be employed fresh or dried for future use. The leaves of moujean tea are somewhat though and, hence, it is essential to infuse the fresh tea for a comparatively longer period. The dried out leaves may, however, be pulverized or grinded for future use. Moujean tea is very delectable and you may add some honey to sweeten this tea before drinking it. Alternately, you may also chill the tea and blend it with rum to enhance the flavour of the liquid. Chefs trying to find a novel flavour ought to try this striking little spicy plant. In fact, the aroma and flavour of this tea would also confound the most experienced epicurean. In an apricot glaze, it would contribute to a pleasant complexity. When included in desserts, the potential of this spice is limitless - anything you can imagine.